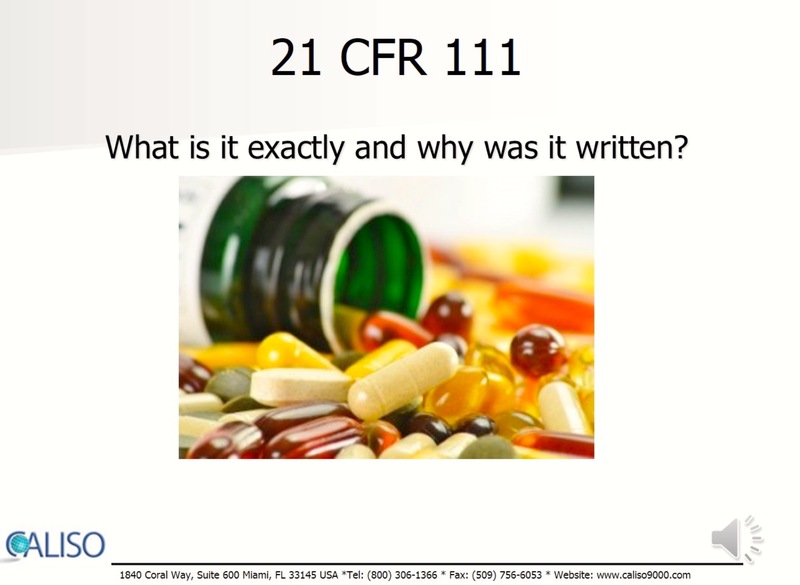 The FDA with 21CFR111 requires each person engaged in manufacturing, packaging, labeling, or holding, or in performing any quality control operations, to have the education, training, or experience to perform the person's assigned functions, and each supervisor whom you use to be qualified by education, training, or experience to supervise. Documentation of training, including the date of the training, the type of training, and the person(s) trained needs to be maintained. It can be taken from anyone's workplace or from home through the Internet with no time limit on when a registered trainee can start or finish. The certificates and courses are accessible online during 3 years. After registration, there is no time limit on when you can start or complete the course. You have complete flexibility in taking the course around your schedule. The cost ranges from $305.96 for groups of 10 or more employees (each student receives his own login and password) to $359.95 for individual training. This is an average 60% cost savings on comparable class courses. The training uses examples and quizzes that give very good exposures on industry related implementation issues. It provides the text of FDA's cGMP for Dietary Supplements (in dark blue) and uses quizzes to give guidance in implementation of the requirements. The Code of Federal Regulations Title 21, Volume 8 Revised as of April 1, 2016, can be obtained from the U.S. Government Printing Office via GPO Access [CITE: 21CFR111]. It uses a continuous evaluation method with on-going quizzes to facilitate the information retention. Quizzes can only be taken once, and once completed cannot be accessed. If your final average in the ongoing evaluation is equal or greater to 70% you will be issued a training certificate you can print for 12 hours of training or 1.2 Continuing Education Unit (CEU) on the Dietary Supplements GMP. If your final average in the ongoing evaluation is less than 70%, you will take a final exam and score above 70% to be issued a training certificate. "I just completed the Interactive online training for the GMP. I liked the fact that I was able to take the class at my convenience from my desk at work. I was able to allocate a few hours over a 4-day period to take the class. The layout of the on-line training was easy to follow. All of the regulation requirements were very easy-to-understand. Also, since each section was followed by a short quiz the entire process didn't feel overwhelming." "..Providing cost-effective uniform training for a management and sales staff that is located world-wide is difficult at best. Arranging travel and schedules to ensure that everyone can get to the training is next to impossible. After researching a number of online training solutions, I found CALISO's program to offer the best bang for the buck." Upon registration using Visa, American Express, or MasterCard you will receive an invoice, and an E-mail notification with the password and link to login and take the class. PO purchases are available for corporate and Federal Government account: fax the PO to (509) 756-6053. THE TRANSACTION IS SECURE: The credit card registration is done through a secure socket, so there is no risk for your credit card information, which is protected and cannot be intercepted. If you are part of a group of users, go to the signup screen , and enter your personal information that will be used in the training certificate. You will be presented with training slides followed by quizzes, after taking a quiz, click on the score button to proceed. Unless otherwise designated, all quiz questions are within the context of the FDA's Dietary Supplements cGMP . -Even if your connection is slow, do not click on buttons such as "Submit", "Login" or "Score" twice. -Empty your browser disk cache on a regular basis to optimize the performance of your browser. -For ease of readability select "Verdana" as your display font. -Do not disable cookies. If you are planning to leave the training for more than 20 minutes, "Save and Exit". The training session times-out after 20 minutes of inactivity. Links to the Good Laboratory Practices (GLP), the Medical Device GMP, and the Food GMP.